Sunday Times bestselling author Simon Scarrow and his former student turned writing partner, Lee Francis, discuss what makes a best seller. 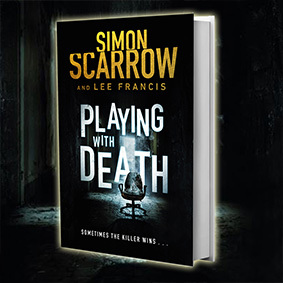 A regular on the Sunday Times bestseller list with his historical novels, Simon has launched an exciting new strand to his writing with Playing With Death written with Lee: both an edge-of-your-seat thriller and a terrifying exploration of the dangers of the modern world. Simon and Lee will discuss how they work together, how they came up with the idea behind Playing With Death, and what it is like for Lee (a debut author) to be working with an established name.